Embark on an odyssey through the antiquities of Greece. Explore the medieval Old Town on the 'Island of Roses' and pick your spot in Santorini for the best sunsets over the Aegean. 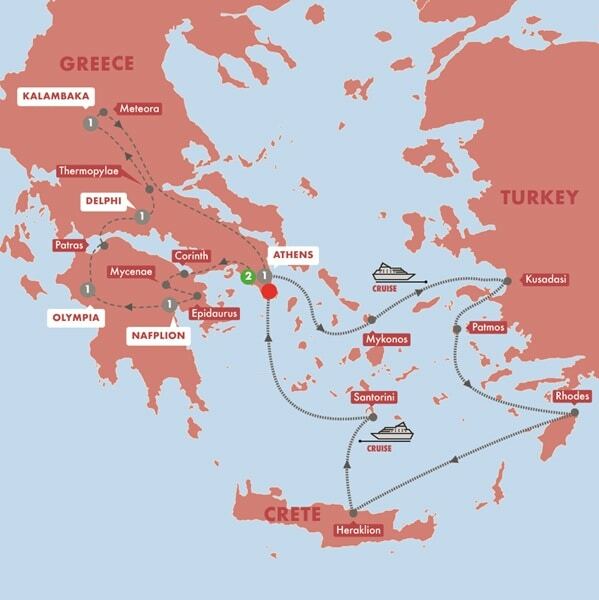 We depart Athens, boarding our ship to cruise the azure waters of the Aegean, bound for Mykonos. Spend the evening getting lost in its labyrinthine lanes lined by white-washed cottages and tumbling cerise bougainvillea. Touch the Turkish coastline and visit the port of Kusadasi for a complimentary Shore Experience to the ancient city of Ephesus. We continue to Patmos later, where the Book of Revelations was written by St. John. Here, you could choose to visit the Cave of the Apocalypse on an Optional Experience. The enchanting Old Town of Rhodes takes centre stage today as we walk in the footsteps of the medieval knights who conquered this land on our Complimentary Shore Experience. We sail to Heraklion on the island of Crete, where we have the opportunity to delve into the centuries-old culture and heritage of the Minoans at the Palace of Knossos. Our final stop today is the beautiful volcanic island of Santorini with its cliff-top villages, where you might consider an optional Shore Experience to the sun-kissed village of Oia.